Ever since I began planning this site, I’ve had the idea of reviewing random trade paperbacks and full graphic novels in mind. I read them pretty constantly in concurrence with single issues of comics. I’ve gone through a few since I started this site. However, none really felt needed for a discussion until I read this one: Hulk of Arabia. Why? In short, it’s a perfect example of why I love comic books. I loved Jeph Loeb and Ed McGuiness’ run on the Hulk comic: he introduction of the Red Hulk, the mystery of his true identity, and the coup staged by the Leader’s Intelligencia. It was an absolute classic of comic book storytelling. It was fun, action-packed, and very smartly written. When Jeff Parker took over, I ended up dropping it. At the time, I wasn’t that familiar with Jeff Parker (I certainly am now, the man is a comic-writing genius), and I had to make some cuts in my pull list. I have been slowly but surely collecting the rest of the series in TPB’s in years since. I really like the character of General Thunderbolt Ross’ Red Hulk. He’s a mean and bitter giant. He’s not a very likeable guy, but he is so much fun to read about. He has his own set of morals that don’t necessarily line up with your average Avenger. I really wish he was still a regular in a comic title these days. The story is pretty simple (in a comic book way). An old friend and colleague of General Ross named Krugauer is killed in action on the border of Egypt and Qatar. He goes to investigate the cause. There, he is challenged by Steve Rogers’ Secret Avengers and a local hero named Arabian Knight. After some convincing, Rogers allows him to continue his investigation, sending him off with the Machine Man. The two discover that a local warlord has gotten ahold of some alien technology as well as super powers that make him nigh-omnipotent. His name is Dagan Shah, the Sultan Magus, and he is trying to establish his own city-state on the border of Egypt and Qatar. The city has sprung up more quickly than possible and has technology beyond anything humanity is capable of. Red Hulk, Machine Man, and Arabian Knight attempt to remove the source of his power and depose him. Right when they are on the cusp of victory, they are interrupted by the US military, led by Red Hulk’s enemy, General Fortean. They inform him that Shah’s nation, Sharzhad, has official sovereignty granted by the United Nations, and that he needs to leave. Red Hulk is forced out, unable to avenge his fallen friend. That’s it. Laid out, it sounds like a lot, but, considering that this is five issues of a comic book series, that’s a pretty succinct plot. Some comics try to cover this in a single issue. This comic keeps it spread out, something being accomplished in every issue. The pacing allows for good characterization and for the reader to get a good feel for the motivation of all the individuals involved, particularly Red Hulk, the Arabian Knight, and Dagan Shah. The last of those turns out to be a pretty compelling villain, and it’s a shame he hasn’t stuck around in other comics. Red Hulk has a really intriguing stake in this conflict. He puts it under the guise of wanting to know what is going on wanting to know what happened to his friend, and he does. However, deep down, he feels like that it’s unfair that this fight is what killed him, and he is angry that the enemy combatants “cheated” by using alien technology to kill him. He also feels guilty, as his last interaction with this man was a fight over the fact that the friend was going into the private sector. He also has to grasp with his own mortality since they are both old war dogs. There’s an underlying racism to his line of thought that is actually pretty interesting. He’s so used to having the power and being on the winning side that he has difficulty comprehending that these Middle Easterners are the ones that killed his friend. He even makes a joke about Dagan Shah getting his powers by “rubbing a magic lamp.” While obviously this isn’t an admirable quality for a person to have, it honestly makes sense that General Thunderbolt Ross would be a little racist. He’s an old white general. It just kind of fits. This resolves itself in subtly as Arabian Knight and even Dagan Shah end up earning the general’s respect. The respect that Dagan Shah earns from Ross is the closest thing to a resolution that the general gets from this excursion, and that’s okay. Honestly, it really works for this story. Not all cases are closed, not all mysteries are solved, and not every friend gets avenged. The art is really good in this too. Zircher and Rosenberg’s collaboration allows for a very gritty art style that fits the Red Hulk and this particular tale very well. The action sequences are depicted very well. The fight between Red Hulk and Dagan Shah in particular is very impressive. It takes place in this place within the Earth that sort of floats between dimensions. It’s very bizarre and unique. The reader can still get a feel for the immense powers that are clashing as Shah and Ross exchange blows. The allegory for the constant border skirmishes that take place in the Middle East is at the surface level. It mean, it’s literally the plot. However, the moral ambiguity from all sides involved makes it feel very real and very relevant. No one here is innocent. Steve Rogers is trying to keep his hands clean, but his inaction is at the risk of the lives of the people living in the middle of this conflict. The surrounding governments try to stay out of it until Dagan Shah brings it to their doorstep. Dagan Shah himself isn’t a terrible guy. The only thing that he did to cross Red Hulk was kill his private contractor friend, and even this he did to preserve his own life. He just wants to establish a nation for his people. However, this has come at the price of a lot of bloodshed. Red Hulk doesn’t really care much about the warring that takes place out here. He just wants to get some form of closure for his friend, even if it means destabilizing governments in an already very unstable area. Arabian Knight may indeed be the most noble of them all. He simply wants peace in his homeland. It’s a complex story told in a very fun and imaginative way with aliens and super heroes. Comic books are always so enjoyable read because they are so good at telling stories in this manner. This is a comic that reminds me why I read comics: great characters, unique stories, and complex themes. 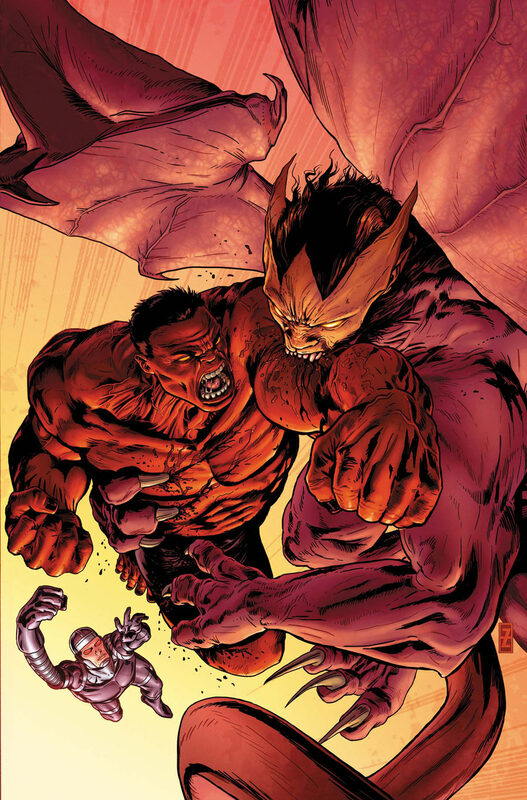 Red Hulk is a character that never really gained a lot of popularity, especially compared to his green counterpart. This series lasted a while, but it is mostly forgotten now. However, take my word for it, it’s worth a look. Jeff Parker is a fantastic writer, and Zircher’s art is topnotch. Red Hulk is a complex and interesting character, and the battles he takes part in are epic. Look for it the next time you’re browsing the TPB’s at your local comic shop. Also, there’s a Manticore in it. That’s worth a few bucks on its own.